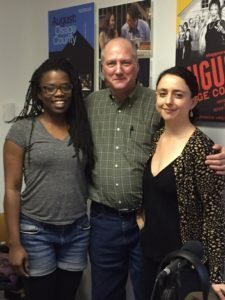 Gary interviews playwright Antoinette Nwandu and director Danya Taymor during rehearsals of Nwandu’s play Pass Over, on site at the Steppenwolf Theatre. We are attending a press performance on June 13 and cannot wait! 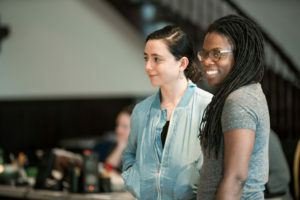 They share fascinating insights about the process of creating a world premiere, with Antoinette developing the script throughout the rehearsal period. These two are absolutely inspiring as artistic collaborators. So much mutual respect, affection, and humor. Booth One would love to be in the rehearsal room! Inspired in part by two young black men Antoinette taught in community college, she riffs on ideas and themes from both Samuel Beckett‘s Waiting for Godot and the Book of Exodus. The cast includes friend of the show, Jon Michael Hill; co-founder of Definition Theatre Company, Julian Parker; and Ryan Hallahan, from the acclaimed cast of Straight White Men, also at Steppenwolf. Ms. Nwandu tells us the Cinderella story about how this play came to be produced at Steppenwolf. Thrilling! 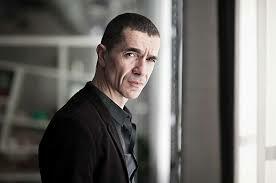 When asked who they would like to spend a month being mentored by, Danya chooses European director extraordinaire Romeo Castellucci. 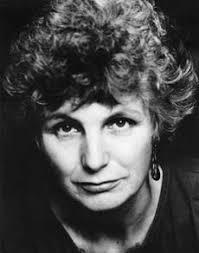 Antoinette chooses the remarkable playwright Caryl Churchill. Good calls! Danya and Antoinette are two theatre artists that are without a doubt “going places”. Booth One is so excited to follow their skyrocketing careers.